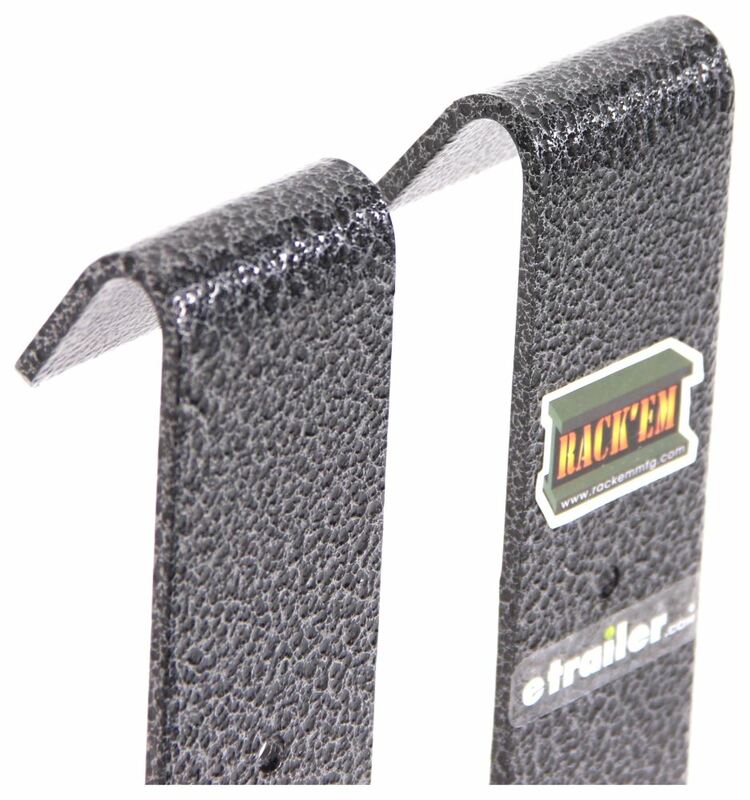 Rack'em Shovel Rack for Enclosed Cargo Trailers Lowest Prices for the best trailer cargo organizers from Rackem. 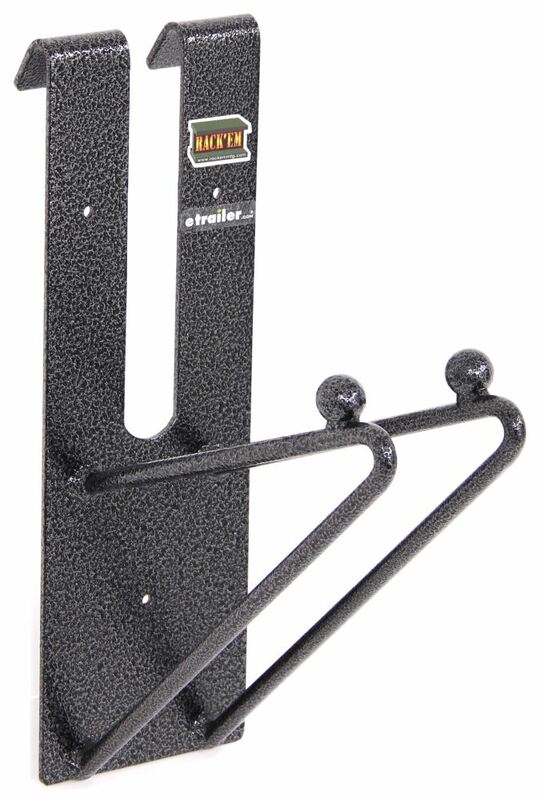 Rack'em Shovel Rack for Enclosed Trailers - Holds up to 6 Shovels part number RA-15 can be ordered online at etrailer.com or call 800-298-8924 for expert service. 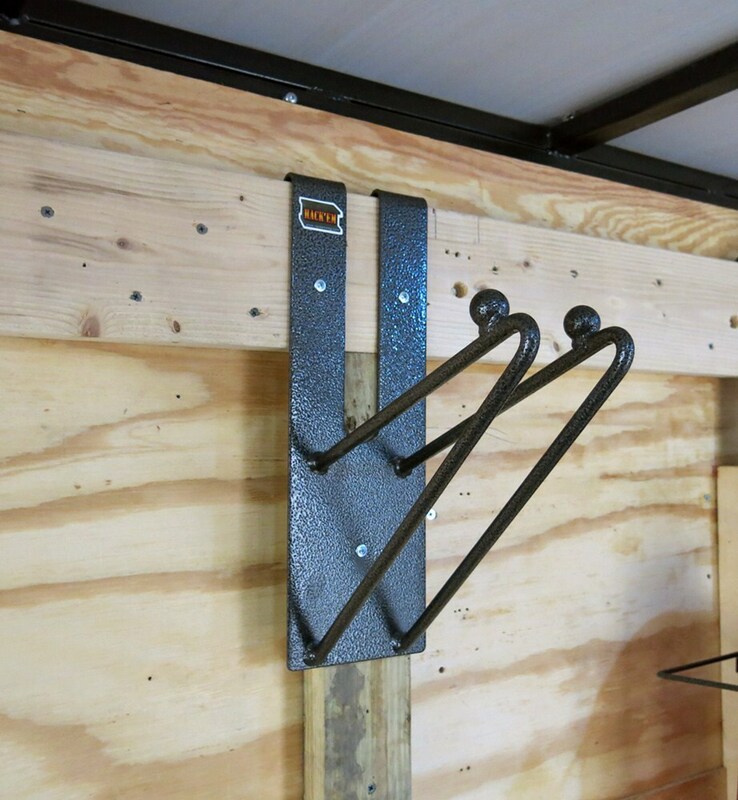 Rack'em enclosed trailer equipment racks feature a hook design at the top of the rack that allows them to hang from the metal frame runner at the top of the side walls on the trailer for added strength. 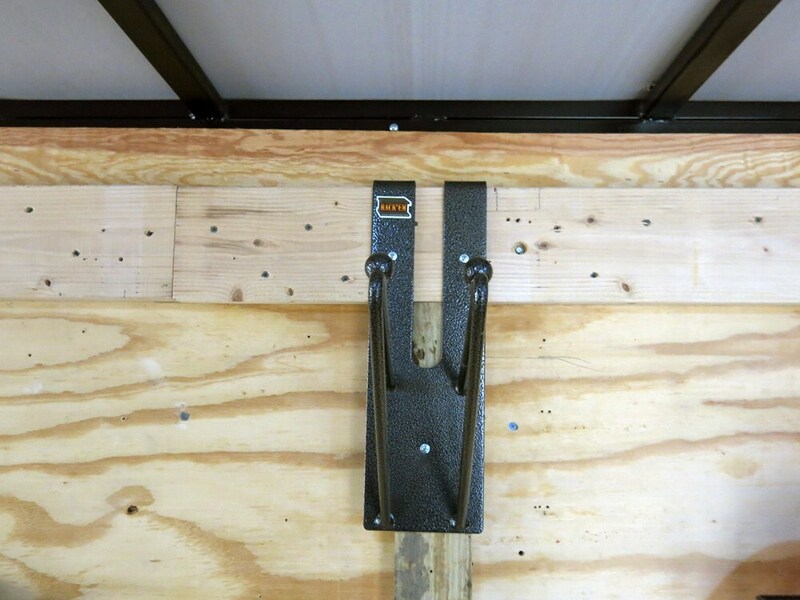 They are predrilled so that they may be screwed securely to the wall. The unique and durable "Hammered" paint finish will last for many years. 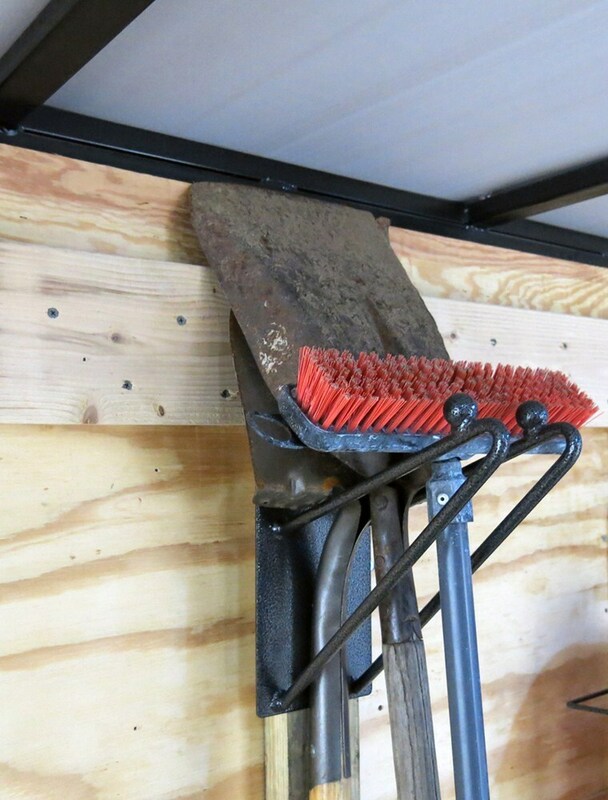 Today we're going to be taking a look at the Rack-em shovel rack for enclosed trailers. 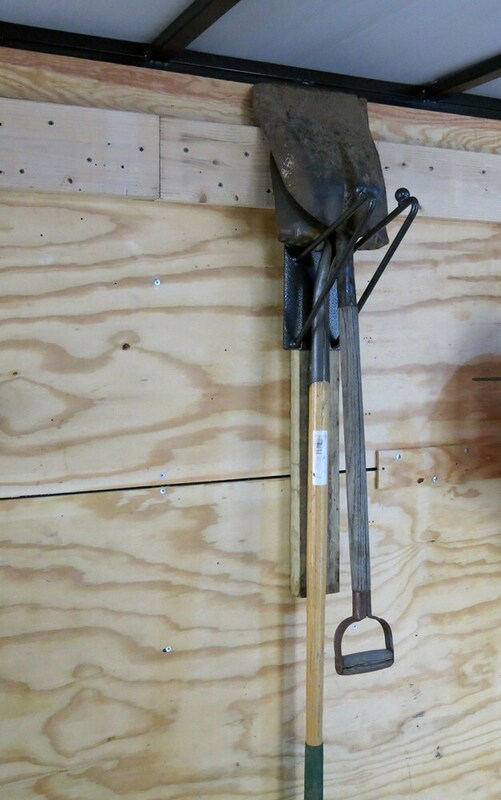 With a six shovel capacity, it's part number is RA-15. 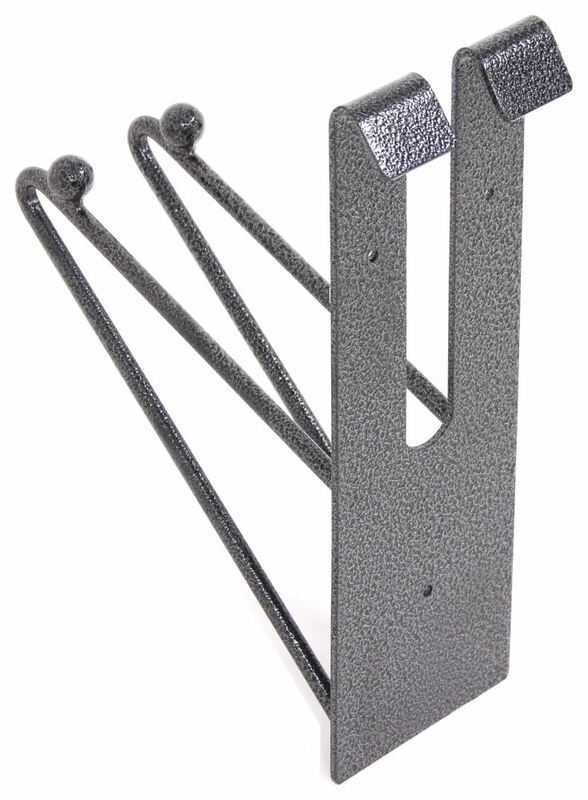 The shovel rack has a durable hammered powder coat finish. 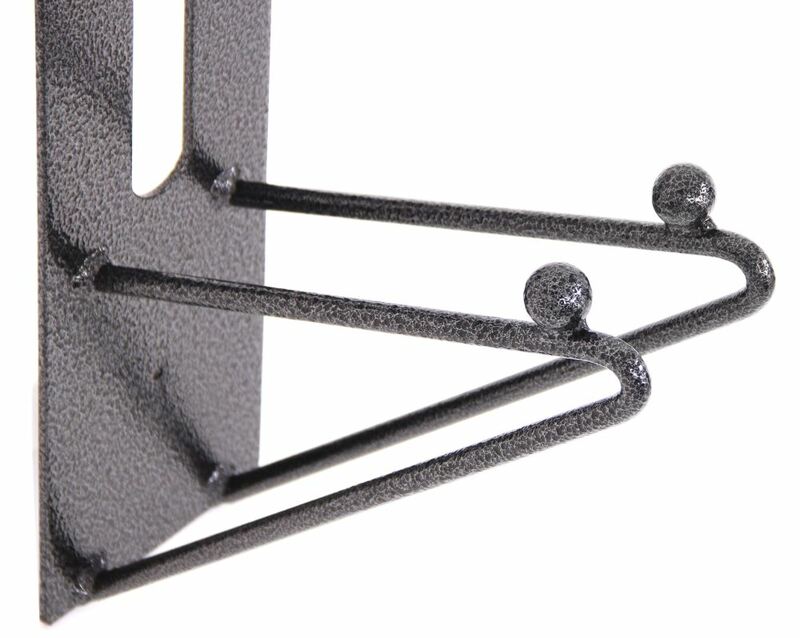 The actual rack portion has a downward angle. 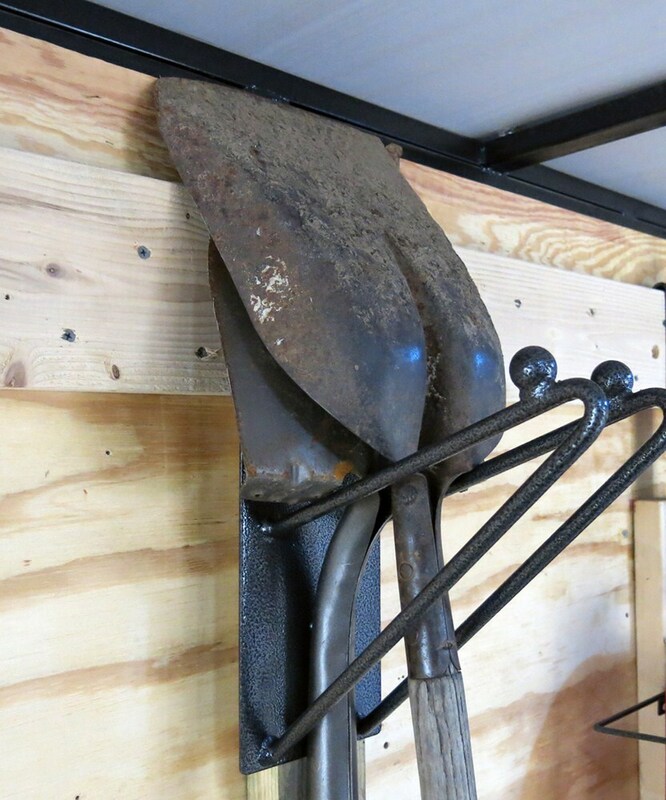 That's going to help hold our shovels in towards the side of the trailer and prevent it from slipping off, as well as the nice large balls that are welding on to each of the arms to keep anything from slipping off of the side. Another great feature is the simple ease of installation. 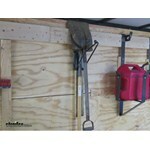 You have two hooks here, these hooks are designed on a round top enclosed trailer to hook right over the top of the rail into where the frame runner is right there. Now, since we have a flat top style of enclosed trailer, we don't have that frame runner there. Basically we've got our wires back there, we don't want to crush those so we've made a two by six that runs the length of our trailer here. It's got a nice angle cut into the back of it and our Rack-em products fit on it perfectly, so if you do have the flat top trailer, it's not really a big deal. Just get yourself a two by six, cut the angle on it, and as you'll see, the product's going to fit on there nicely. Now it's just as simple as putting our screws into place in the three locations. Please keep in mind, the hardware is not provided. The main hooks here at the top, this is what really supports the load. These are just to kind of hold it in place and keep it where it needs to be. Let's get some measurements for you, so you know exactly what kind of room you're going to need to mount the rack. We'll go from the top down. Right to the very bottom edge, we're going to have about 16 1/8 of an inch. From outside to outside, we've got 5 3/8 of an inch and from our mounting surface to the furthest end of our rack, we've got about 10 3/4 of an inch. You just want to keep that in mind and make sure you've got a suitable mounting location for it. We'll just take our shovels and place them right in. As you can see, it really holds it up against the side nicely. It's going to keep it from moving around too much, making too much noise. We can just stack them on up until we get our six of them in. This can be used with many different items. 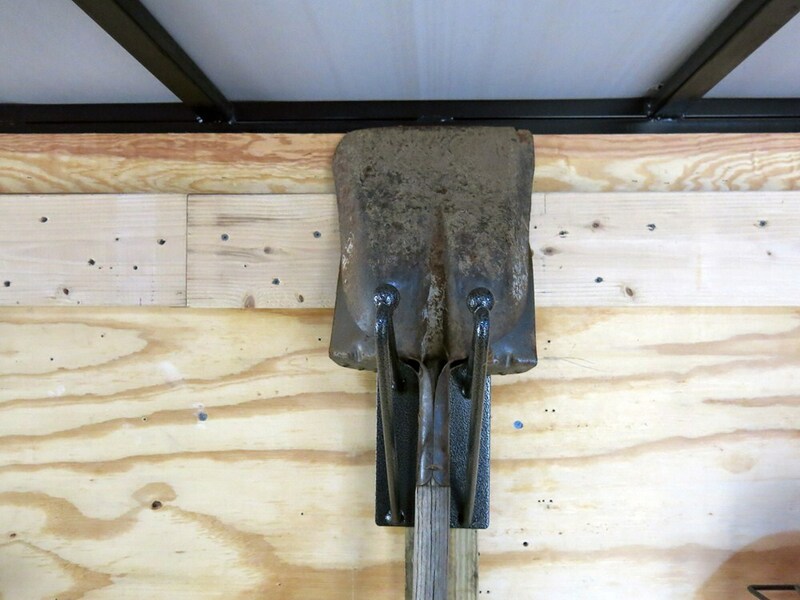 It doesn't have to be a shovel. Anything that's got a flat surface across it, you can stick up in there. Just kind of keep all the stuff up off the floor where it will get in the way. 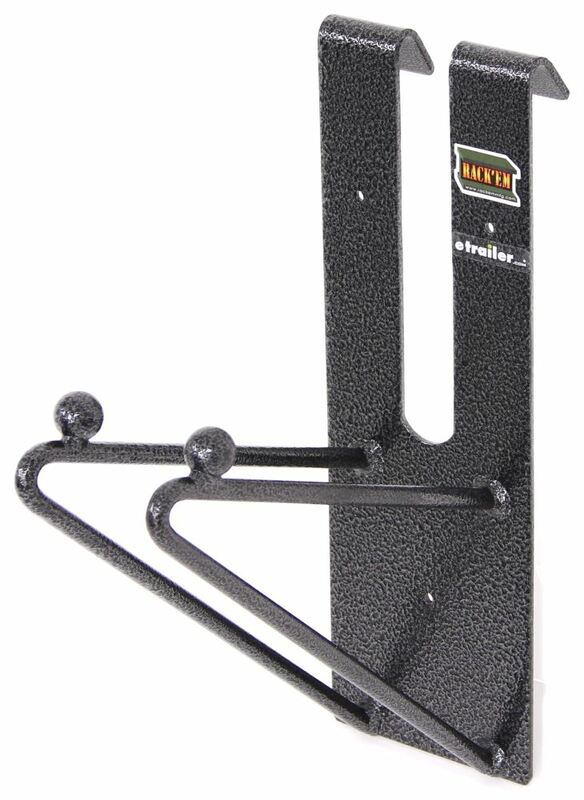 That will complete today's look at the Rack-em shovel rack for enclosed trailers with the six shovel capacity, part number RA-15. .